Sen also welcomed Law Minister Veerappa Moily's stand that the country's sedition laws needed a 'relook' and gave a clarion call for a campaign by the civil society against these legislations. 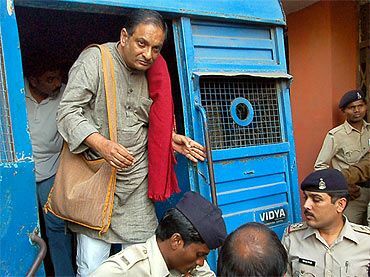 Asserting that the charge of sedition slapped on him was 'misplaced,' Sen, who walked free from the Raipur central prison after the Supreme Court granted bail on Friday last, also categorically said that he has never betrayed his country. "I know in my heart that I have never betrayed our country. I am in no way a traitor," the 61-year-old medical doctor said shortly after his release from the prison where he has been lodged since December 24 last after being sentenced to life by a trial court. Sen said the Supreme Court decision to grant him bail was a 'big' one. "It is a big decision by the Supreme Court whose political implication is very deep," said Sen, who was flanked by his wife, mother and two daughters at their media interaction. 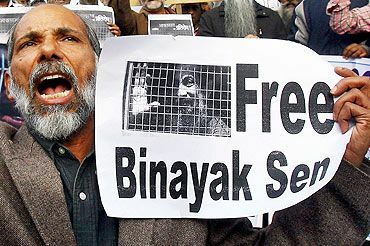 Will Binayak's bail lead to changes in sedition laws? Stating categorically that there was no case of sedition against Sen, a bench of Justices Harjit Singh Bedi and Chandramauli Kumar Prasad had said, "We are in a democratic country. At best he (Binayak Sen) is a sympathiser. There are many sympathisers of a cause." The apex court in a scathing observation also said that a person does not become a Gandhian just because he is found with a biography of Mahatma Gandhi. Hours after the Supreme Court granted bail to Sen, Law Minister Moily dubbed sedition laws as 'outdated' and said he would ask the law commission to study the issue. Moily said he would soon consult Home Minister P Chidambaram and after he agrees, the matter could be referred to the law commission to study whether there was need for change in sedition laws. Sen, who is charged with having links with Maoists, also made it clear that he is not a sympathiser of any group. 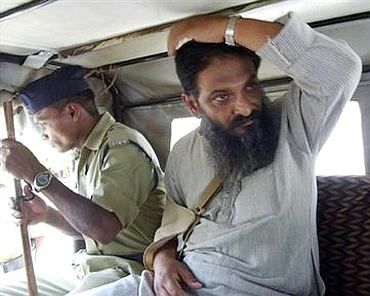 "There is no evidence in this matter (links with Maoists)," he added. Sen began his media interaction saying he was 'very happy' at being released on bail and thanked people for their massive support. "There was a national and international campaign for me," he said." I am not alone." 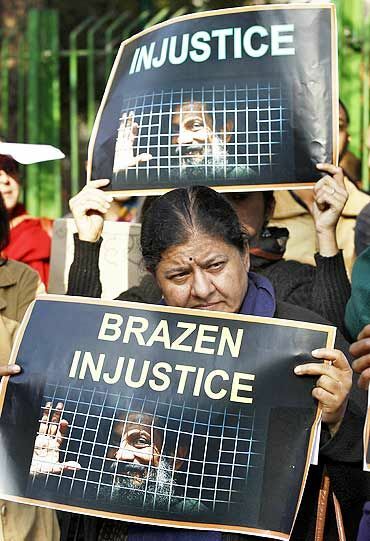 Sen, who is a member of the Peoples Union for Civil Liberties, also said there must be an end to Salwa Judum movement -- an anti-Naxal movement involving grassroot people -- in Chattisgarh so that peace can prevail. He also made it clear that he is against all forms of violence. Sen while pressing for a nation-wide campaign for revising sedition laws said there are thousands of people like him behind bars in different parts of the country after being slapped with sedition charges. "We are very much heartened to take note of comments of Veerappa Moily with reference to section 121 and section 124 of IPC," he said. "We want a situation to be brought out in which the definition of loyalty to the people of this country is more in keeping with the free citizens of a free country rather than something that we have inherited from our colonial masters," Sen said. Sen's wife Ilena Sen in a sarcastic remark aimed at the Chattisgarh government said, "If you try to become a good citizen then it is not acceptable to the state government."